If you’re looking for Beer Pong Tables in Australia, In Any Event has got you covered. We offer our buyers the best possible deals on our unique fold up Beer Pong Tables. In Any Event proudly presents our unique Folding Beer Pong Tables guaranteed to make your next party a big hit. Our exclusively-designed Tables are available in 8 different styles including Basketball Court, Woodgrain Timber, Red vs Blue, Sink it and Drink it, Tron style, Champong and Top gun. Exclusive illuminated LED Beer Pong Tables are also available. They are durable, light-weight and made from quality materials and also feature an attached bottle opener. The tables are a compact fold-up design, making them easy to move and store. Once set up our Beer Pong Tables measure the official competition length of 8ft. 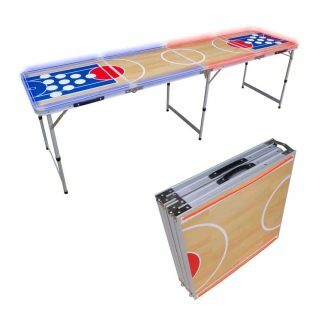 Enjoy the classic game of Beer Pong anywhere and anytime with In Any Event’s Folding Beer Pong Table. Shipped Australia Wide!